So in addition to it being Star Wars Day, May the 4th was also Free Comic Book Day, a day designed to get folks out to their Local Comic Book Store (LCBS for the nerdier among us) and get free stuff. The major publishers put out a few reprints, and the odd original work. The LCBSes usually run all sorts of sales to catch the wallets of the patrons like bottom trawlers. Every year I swear I’m not going in, because I hate crowds, and I always buy something I probably don’t need. Every year I end up there anyway. Finding this series was one of those fated moments. I was only in the LCBS because my brother wanted to see what sales they had on their used video games. After torturing him and his wallet by drawing his attention to two normally overpriced ATLUS titles, I headed over to the longboxes to avoid making a $40+ purchase myself. Now, Dr. 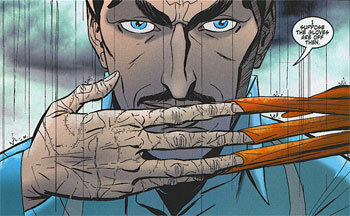 Strange is a character I’ve always been interested in, but never enough to seek out a title where he’s the head-liner. I hadn’t even heard of this series before I saw it in the longbox that day. What caught my eye under his name, though, was the name of one of my favourite writers working in comics today, Brian K. Vaughan. I haven’t read his entire body of work yet, but I haven’t come across a title written by him that I haven’t enjoyed. At $1 an issue, the trawlers had caught my wallet once again. Writer Brian K. Vaughan and penciller Marcos Martin’s Dr. 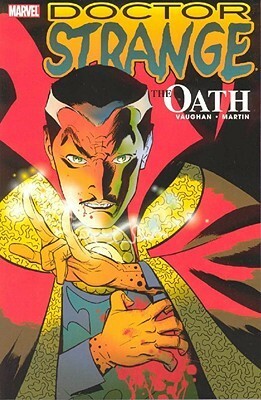 Strange: The Oath is a 5 issue limited series from 2006, featuring Marvel’s Sorcerer Supreme as he attempts to find a mystical cure for his cancer-ridden Apprentice/Butler/Manservant, Wong. Along the way, they meet the Night Nurse, a young doctor who has made a name for herself by running an exclusive after hours clinic to patch up costumed vigilantes. The trio track down a mysterious thief who has stolen Wong’s one chance for survival. The biggest strength of this book for me is Vaughan’s writing. If you’re a fan of his work (Y: The Last Man, Ex Machina, Runaways), you know exactly what you’re going to get here. Vaughan loves to write quick-witted characters that fire insults an pop-culture references back and forth. His stories are generally easy to follow–often to the point of predictability–but still fun to read. That’s probably why I enjoy reading his work as much as I do. I think he’s someone that actually has fun while writing, and it comes across on the page. Even Super Heroes have to deal with waiting rooms. This strength could also be considered a weakness here, though. As I’ve mentioned, I’m not very familiar with Dr. Strange, but what I have seen of him never gave me the impression that he was a pop-culture savvy, quick-witted ball-buster. He seemed like a character that should be reserved, arrogant, condescending and aloof. Vaughan nails the arrogant, but doesn’t always land the other details. Sometimes those other details are there, but on the whole, Dr. Strange feels wildly inconsistent. Particularly at the story’s end, which I think could leave many a True Believer shaking their head. Dr. Strange never struck me as the type to cuss in front of a lady. Marcos Martin is an artist I’m completely unfamiliar with, but he turns out strong enough art to slow down the page-turning. 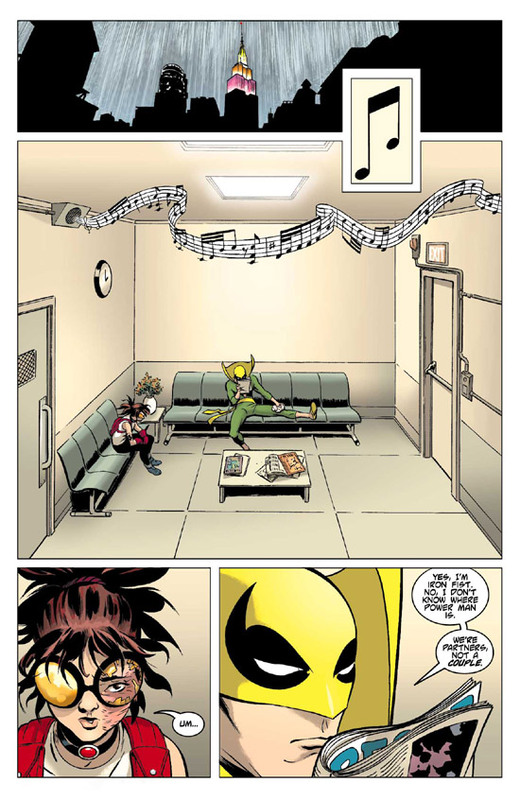 It’s good, the pages and panels flow nicely, but Marcos’ style seemed simplistic. I can’t think of any pages where the art wowed me, but it wasn’t jarring either. I think I would have liked to see artwork that was a bit more detailed, or ornate, in a title featuring Dr. Strange. Something that really holds back this story, though, is that it’s one of those stories where superheroes take on real world issues. Dr. Strange essentially ends up confronting the problems of the Health Care Industry in America, and the fact that Big Pharma has a choke hold on the ill and infirm. I don’t think the story got too heavy handed with either a pro- or anti-corporate message, though the implication that corporations are bad is definitely there. But I don’t think it’s any more or less than every other work of fantasy or sci-fi out there. On the whole, this is a solid title with some noticeable weaknesses. I don’t know how fans of Dr. Strange would receive this story, because it seems like it may take a bit too much liberty in the portrayal of the Sorcerer Supreme, but it’s an excellent introduction. Even if Dr. Strange’s characterization is a bit inconsistent, and the ending is arguably horrible, Vaughan and Martin create a tale that still reads well and looks good, and leaves you interested in finding out more about the life and times of Stephen Strange. Got this series as it was coming up in floppies. I’m not a Dr. 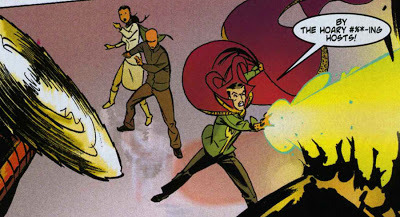 Strange True-Believer, but I’m a big fan of BKV and Marcos Martin. I love Martin’s clean lines, he’s almost like an slightly stylized Darwyn Cooke. I agree this series was very solid, but not one for the ages, and certainly won’t go down as a BKV classic like Y: The Last Man, Ex Machina, or Saga. Oh, if you aren’t you should be reading Saga. I’d never seen Martin’s work before this. I don’t think I’d hunt down any of his other stuff specifically because he did it, but I wouldn’t be upset to find out he’s pencilling something I’m interested in. Saga’s on my radar… and I’ll probably get at least the first trade before summer’s out. I’ve got a few trades I’d like to get first. The LCBS is running a buy 3 for $20 sale on some of their overstock, so it’s taken a large chunk of my pitiful monthly comic allowance. I’ve got Saga pencilled in after I pick up Walking Dead Vol 18 in June. I also read this when it came out, and I agree with you and K2; it’s all right, but it’s not great, and although I’m not a big Dr. Strange aficionado, this doesn’t quite fit my image of him. I didn’t go to free comic book day even when I was collecting comic books regularly. There are only two comic book shops in town, and both are in locations where it’s extremely difficult to find parking. It was OK on a Wednesday, I could usually just walk down during my lunch break or hit the store in the one hour after work closed but before the shop closed. But FCBD? Forget it. It’d be a madhouse all day… especially that one time when it was on Cinco de Mayo. Couldn’t get me to drive anywhere near the city on that day. I’m usually there later in the day, usually when the Free Comics are gone, but the sales are still going. I think it’s an unwritten rule that if a store sells comics it has to be impossible to park near.